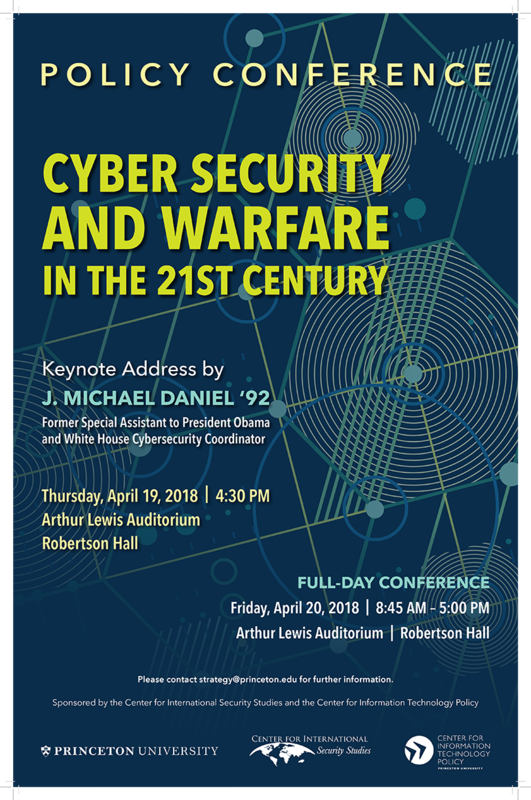 Mr. Daniel’s keynote address launches the policy conference, Cyber Security and Warfare in the 21st Century, co-sponsored by the Center for International Security Studies and the Center for Information Technology Policy. 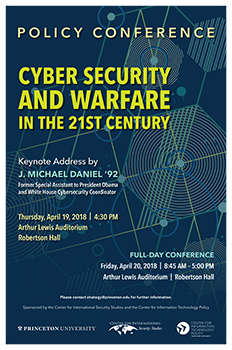 The conference will take place on Friday, April 20, 2018 from 8:45 a.m. – 5 p.m. in Robertson Hall, Arthur Lewis Auditorium. For further information regarding J. Michael Daniel, please click here. For further information and the schedule for the conference, please click here. Michael Daniel currently serves as the president of the Cyber Threat Alliance (CTA). CTA works to improve the cybersecurity of our global digital ecosystem by enabling real-time, high-quality cyber threat information sharing among companies and organizations in the cybersecurity field. Prior to joining the CTA in February 2017, Michael served from June 2012 to January 2017 as special assistant to President Obama and cybersecurity coordinator on the National Security Council Staff. In this role, Michael led the development of national cybersecurity strategy and policy, and ensured that the US government effectively partnered with the private sector, non-governmental organizations, and other nations. This event is co-sponsored with the Center for International Security Studies.